According to the Drought Monitor, drought conditions improved recently across some of the US. As of Mar. 12, 2013, 47.3% of the contiguous US is experiencing moderate or worse drought (D1-D4) as the 2011-2012 drought extended well into 2013. That is the lowest percentage in a number of months. The percentage area experiencing extreme to exceptional drought increased from 14.6% to 14.7%, but this is ~3% lower than it was three months ago. Percentage areas experiencing drought across the West decreased in the past month as a series of late season cyclones impacted the region. Drought across the Southwest worsened slightly while rain from storms maintained the low-level of drought conditions in the Southeast. My previous post preceded the series of major winter storm that affected much of the US. In some places in the High Plains and Midwest, 12″ or more of snow fell. With relatively high liquid water equivalency, each storm dropped almost ~1″ of water precipitation, of which the area was in sore need. Unfortunately, these same areas required 2-4″ of rain to break their long-term drought. In other words, while welcome, recent snows have reduced the magnitude of the drought in many areas, but have not completely alleviated them. Ironically, a very different problem arose from these storms: flooding. Figure 1 – US Drought Monitor map of drought conditions as of April 25th. 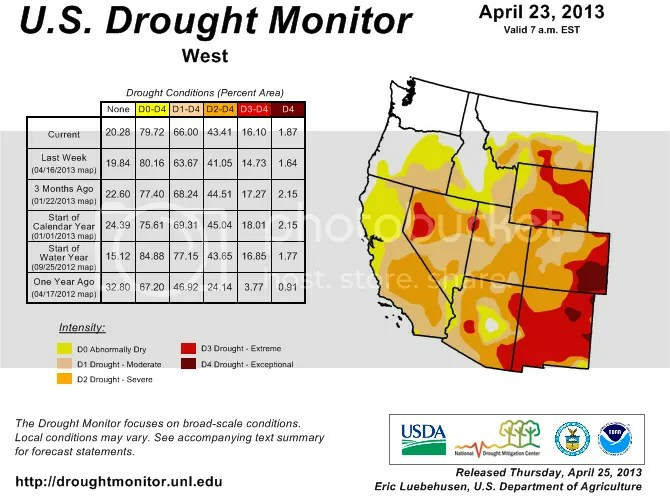 Figure 2 – US Drought Monitor map of drought conditions in Western US as of April 25th. Some relief is evident in the past month (see table on left), including some changes in the mountains as storms recently dumped snow across the region. Mountainous areas and river basins will have to wait until spring for snowmelt to significantly alleviate drought conditions. As you can probably tell, this is a large area experiencing abnormally dry conditions for about one year now. 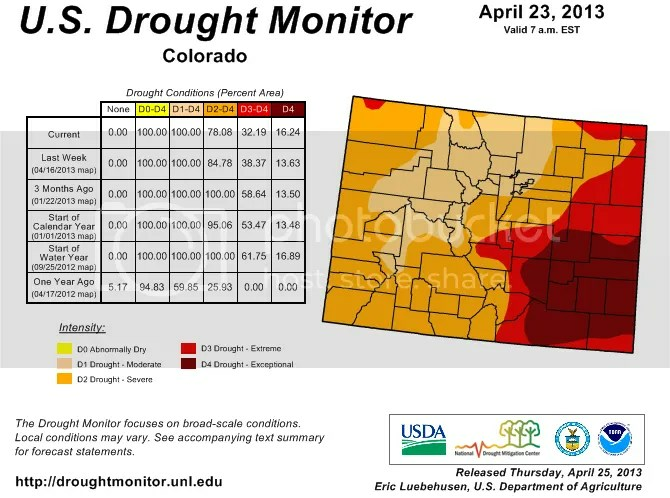 Figure 3 – US Drought Monitor map of drought conditions in Colorado as of April 25th. There is some evidence of relief evident over the past three months here. Instead of 100% of the state in Severe drought, only 78% is today. The central & northern mountains, as well as the northern Front Range (Denver north to the border) enjoyed the most relief since February. The percentage area in Extreme drought also dropped significantly from 59% to 38%. Exceptional drought shifted in space from northeastern Colorado to central Colorado while southeastern Colorado remained very dry. Drought conditions improved somewhat across the southwestern portion of the state in the past couple of weeks. The percentage area that is experiencing less than Severe drought conditions continues to track downward, which is a good sign. Unfortunately, Exceptional drought conditions continued their hold over the eastern plains. 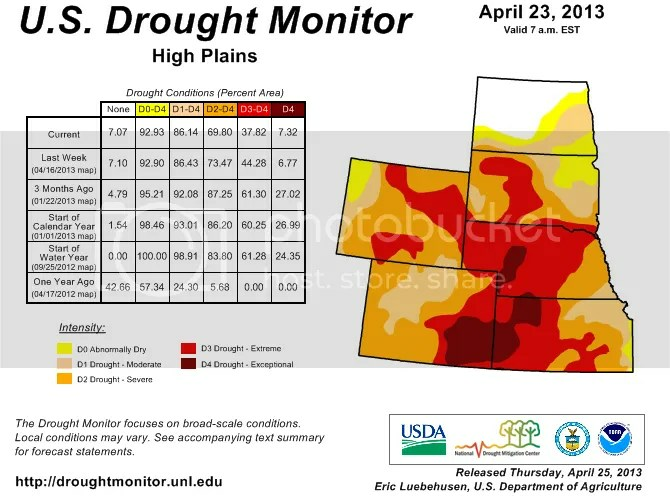 Figure 4 – US Drought Monitor map of drought conditions in the High Plains as of April 25th. The large storms that moved over this area in the past month reduced the worst drought conditions across Nebraska, South Dakota, and Wyoming. The percentage area with Exceptional drought dropped from 27% to 7%; Extreme drought dropped from 61% to 28%; and Severe drought dropped from 87% to 70%. With rather significant areas still experiencing moderate or worse drought across much of the US west of the Mississippi River, drought remains a serious concern in 2013. I previously hypothesized that much of the 2012 drought was partly a result of natural climate variability and underlying long-term warming. I wrote about NOAA’s examination into the causes of the 2012 drought a couple of weeks ago in which the authors suggested it was not heavily influenced by long-term warming. US drought conditions are more influenced by Pacific and Atlantic sea surface temperature conditions. Different natural oscillation phases preferentially condition environments for drought. Droughts in the West tend to occur during the cool phases of the Interdecadal Pacific Oscillation and the El Niño-Southern Oscillation, for instance. Beyond that, drought controls remain a significant unknown. Population growth in the West in the 21st century means scientists and policymakers need to better understand what conditions are likeliest to generate multidecadal droughts, as have occurred in the past. As drought affects regions differentially, our policy responses vary. A growing number of water utilities recognize the need for a proactive mindset with respect to drought impacts. The last thing they want is their reliability to suffer. Americans are privileged in that clean, fresh water flows when they turn their tap. Crops continue to show up at their local stores despite terrible conditions in many areas of their own nation (albeit at a higher price, as we will find this year). Power utilities continue to provide hydroelectric-generated energy. Needless to say, with record low temperatures due to vigorous synoptic cyclones that brought Arctic air masses down into the middle of the country, April’s average temperature is among the lowest on record. I will have more to say about that next week after the month ends. Denver may not record a bottom-10 moth because much more seasonable weather is on tap for the next week. In contrast, two record highs were set in April 2012: 84F on the 1st and 88F on the 24th. In other news, Boulder, CO set a monthly record for snowfall: 47.4″ through the 23rd! The old record of 44″ was set in 1957. The official snowfall measurement site for Denver (Denver Int’l Airport) recorded “only” 20.4″ of snow for the month-to-date. With 60F+ temperatures forecasted from today through next Tuesday, DIA won’t challenge the top-10 snowiest Aprils (#10 recorded 21.0″ of snow). Remember that one month’s, season’s or year’s temperatures, precipitation, or even drought are not indicative by themselves of climate change. They are too heavily influenced by individual weather systems. When I discuss climate change, I write about long-term trends (decadal to multi-decadal). Natural variability influences individual weather events that overlie the long-term climate signal. I’ve written before that climate change means we are more likely to see record high temperatures than record low temperatures. The weather will continue to set both, but will set the former at a higher rate moving forward than the latter. Of course, I for one am very glad there was more precipitation than normal for April. Last year’s drought and record hot summer was not enjoyable to live through. Denver-Boulder and the surrounding region will unfortunately need months in a row of above average precipitation to break the long-term drought. This spring’s precipitation pattern slightly reduced the intensity and areal coverage of drought. I will update my last drought post in the next couple of days. Categories: environment, global warming, science | Tags: Boulder weather, climate change, climate change effects, Denver precipitation, Denver temperature, Denver weather, drought, global warming, snowfall, temperature record | Permalink. According to data released by NOAA, March was the 10th warmest globally on record. Here are the NOAA data and report. NASA also released their suite of graphics, but their surface temperature data page is down today, so I cannot relay how NASA’s March temperature compares to historical Marches. Once their site is back up, I will update this post. [Update: NASA’s analysis resulted in their 9th warmest March on record. Here are the data for NASA’s analysis.] The two agencies have slightly different analysis techniques, which in this case resulted in not only different temperature anomaly values but somewhat different rankings as well. The two techniques provide a check on one another and confidence for us. March’s global average temperatures were 0.59°C (1.062°F) above normal (1951-1980), according to NASA, as the following graphic shows. The past three months have a +0.57°C temperature anomaly. And the latest 12-month period (Apr 2012 – Mar 2013) had a +0.60°C temperature anomaly. The time series graph in the lower-right quadrant shows NASA’s 12-month running mean temperature index. The recent downturn (2010-2012) was largely due to the latest La Niña event (see below for more) that ended early last summer. Since then, ENSO conditions returned to a neutral state (neither La Niña nor El Niñ0). Therefore, as previous anomalously cool months fall off the back of the running mean, and barring another La Niña, the 12-month temperature trace should track upward again throughout 2013. Figure 1. Global mean surface temperature anomaly maps and 12-month running mean time series through March 2013 from NASA. According to NOAA, March’s global average temperatures were 0.58°C (1.044°F) above the 20th century mean of 12.7°C (54.9°F). NOAA’s global temperature anomaly map for March (duplicated below) shows where conditions were warmer than average during the month. Figure 2. Global temperature anomaly map for March 2013 from NOAA. The two different analyses’ importance is also shown by the preceding two figures. Despite small differences in specific global temperature anomalies, both analyses picked up on the same temperature patterns and their relative strength. The very warm conditions found over Greenland are a concern. Greenland was warmer than average during more months in recent history than not. In contrast to 2012, northern Eurasian temperatures were much cooler than normal. This is likely a temporary, seasonal effect. Long-term temperatures over much of this region continue to rise at among the fastest rate for any region on Earth. Figure 3. 500-mb heights (white contours) and anomalies (m; color contours) during March 2013. Note the correspondence between the height map and the NASA & NOAA surface temperature maps: lower heights (negative height anomalies) present over the North Atlantic and northern Eurasia overlay the cold surface temperature anomalies at the surface. Similarly, warm surface temperature anomalies are located under the positive 500-mb height anomalies. Figure 4. Time series of weekly SST data from NCEP (NOAA). The highest interest region for El Niño/La Niña is NINO 3.4 (2nd time series from top). The last La Niña event hit its highest (most negative) magnitude more than once between November 2011 and February 2012. Since then, tropical Pacific sea-surface temperatures peaked at +0.8 (y-axis) in September 2012. You can see the effect on global temperatures that the last La Niña had via this NASA time series. Both the sea surface temperature and land surface temperature time series decreased from 2010 (when the globe reached record warmth) to 2012. So a natural, low-frequency climate oscillation affected the globe’s temperatures during the past couple of years. Underlying that oscillation is the background warming caused by humans. And yet temperatures were still in the top-10 warmest for a calendar year (2012) and individual months, including March 2013, in recorded history. Skeptics have pointed out that warming has “stopped” in recent years (by comparing recent temperatures to the 1998 maximum which was heavily influenced by a strong El Niño even), which they hope will introduce confusion to the public on this topic. What is likely going on is quite different: a global annual energy imbalance exists (less outgoing energy than incoming energy). If the surface temperature rise has seemingly stalled, the excess energy is going somewhere. That somewhere is likely the oceans, and specifically the deep ocean (see the figures below). Before we all cheer about this (since few people want surface temperatures to continue to rise quickly), consider the implications. If you add heat to a material, it expands. The ocean is no different; sea-levels are rising in part because of heat added to it in the past. The heat that has entered in recent years won’t manifest as sea-level rise for some time, but it will happen. Moreover, when the heated ocean comes back up to the surface, that heat will then be released to the atmosphere, which will raise surface temperatures as well as introduce additional water vapor. Thus, the short-term warming rate might have slowed down, but we have locked in future warming (higher future warming rate) as well as future climate effects. Figure 5. Total global heat content anomaly from 1950-2004. An overwhelming majority of energy went to the global oceans. Balmaseda et al.’s work demonstrates the transport of anomalous energy through the depth of the global oceans. Note that the grey lines’ lack of significant change from 2004-2008 (upper 300m). Observations of surface temperature include the very top part of this 300m layer. Since the layer hasn’t changed much, neither have surface temperature readings. Note the rapid increase in heat content within the top 700m. Given the lack of increase in the top 300m, the 300-700m layer heat content must have increased. 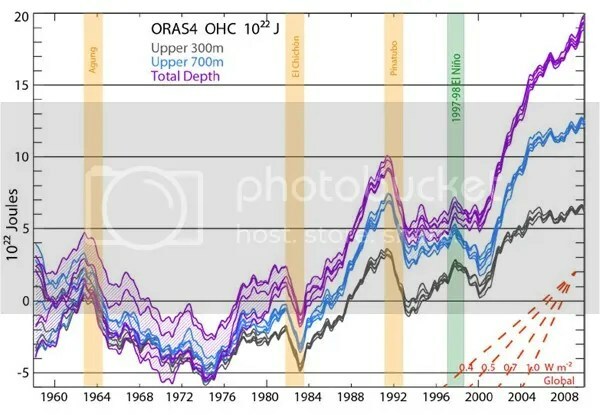 By the same logic, the rapid growth in heat content throughout the depth of the ocean, which did not stall post-2004, provides evidence for anomalous heat location. You can also see the impact of major volcanic eruptions on ocean heat content: less incoming solar radiation means less absorbed heat. A significant question for climate scientists is this: are climate models capable of picking up this heat anomaly signal and do they show a similar trend? If they aren’t, then their projections of surface temperature change is likely to be incorrect since the heat is warming the abyssal ocean and not the land and atmosphere in the 2000s and 2010s. If they aren’t, climate policy is also impacted. Instead of warmer surface temperatures (and effects on drought, agriculture, and health to name just a few), anomalous ocean heat content will impact coastal communities more than previously thought. Consider the implications of that in addition to the AR4’s lack of consideration of land-based ice melt: sea level projections could be too conservative. That said, it is also a fair question to ask whether today’s climate policies are sufficient for today’s climate. In many cases, I would say they aren’t sufficient. Paying for recovery from seemingly localized severe weather and climate events is and always will be more expensive than paying to increase resilience from those events. As drought continues to impact US agriculture, as Arctic ice continues to melt to new record lows, as storms come ashore and impacts communities that are not prepared for today’s high-risk events (due mostly to poor zoning and destruction of natural protections), economic costs will accumulate in this and in future decades. It is up to us how many costs we subject ourselves to. As President Obama began his second term with climate change “a priority”, he tosses aside the most effective tool available and most recommended by economists: a carbon tax. Every other policy tool will be less effective than a Pigouvian tax at minimizing the actions that cause future economic harm. It is up to the citizens of this country, and others, to take the lead on this topic. We have to demand common sense actions that will actually make a difference. But be forewarned: even if we take action today, we will still see more warmest La Niña years, more warmest El Niño years, more drought, higher sea levels, increased ocean acidification, more plant stress, and more ecosystem stress. The biggest difference between efforts in the 1980s and 1990s to scrub sulfur and CFC emissions and future efforts to reduce CO2 emissions is this: the first two yielded an almost immediate result while it will take decades before CO2 emission reductions produce tangible results humans can see. I wrote about some carbon market-related items I ran across last month. While I haven’t had time yet to read the RGGI report that Jason Brown linked to (research and family duties leaves very little time for anything else), I have read additional items since that post that I want to collect here for when I do have more time. Let me state at the outset that I think carbon markets are one piece of a large puzzle. From what I’ve read to date, I get the impression that most carbon markets are not set up in such a way (yet) that actually addresses what I think they’re supposed to address: a reduction in greenhouse gas emissions, especially CO2. Part of the reason for this is the way the groups set up and managed markets. This results from lack of appropriate policy that demands of and allows for organizations to set up and run an efficient market. To close this introduction, I will observe again that most economists recommend a carbon tax if the true intent of a policy is to reduce emissions. I was surprised to learn this since I don’t think most economists are bleeding-heart liberals; nor do I think they are part of the vast conspiracy to establish a one-world government that controls every aspect of our lives. They base their recommendation on fundamental economic principles – a scary thought in today’s reactionary world, I know. What does “back-loading” mean? Back-loading would have taken some allowances out of the European market for two years. Without as many allowances, the price of carbon likely would have increased. How over-allocated is the market? “The surplus is 1.5 billion-2 billion tonnes, or about a year’s emissions.” There are varying opinions as to what the appropriate price should be to achieve behavioral change. Back-loading might have increased the price to ~10 euros (1/3 its original price, which many people think is the minimum necessary). As I wrote last year, one fundamental problem with the European market was the number of allowances was far too high. But even if the price was “right”, would carbon markets work? Probably not right away. Another problem with them is intense lobbying by fossil fuel entities (to weaken the efficacy of the market; they abandon calls for “free market” support when it comes to carbon taxes/markets) as well as the corruption and non-transparency in the market. The California cap-and-trade scheme establishes a floor and a ceiling for price, which might alleviate some of the problems the Euro ETS has. The European scheme, by keeping carbon prices so low, sends the wrong signal. Thus, power utilities are switching from natural gas to coal, despite the fact that burning coal releases twice as much carbon per unit of energy produced. In that sense, the US energy market is acting correctly when falling natural gas prices encourage utilities to switch from coal to natural gas. The European’s situation leads to an interesting dilemma. They have admonished the US for decades on lack of climate action. Yet Europe did not achieve the first round of Kyoto Protocol-inspired emissions targets and if they continue the switch from cleaner fuels to dirtier fuels, they will not hit the next round they set for themselves either. One solution could be the implementation of new cap-and-trade schemes in other countries, as this CleanTechnica article discusses. If other planners examine the European scheme and make efforts to correct as many mistakes as possible, then include mechanisms to trade with other schemes around the world, the Europeans may not abandon their market. That would also give the Europeans time to see what solutions are implemented around the world and eventually include them in their own program. The Chinese, as is other energy-climate topics, are very important in this regard, not only because they are currently the largest global emitters. The Chinese government can put programs in place that are not subject to the same kind of political pressures present in the US or Europe. The US is also very important for the future of markets, emissions, and concentrations. The US of course currently does not have a cap-and-trade scheme, thanks to the outsized political influence fossil fuel companies have. Small schemes exist or are coming on-line however. The Regional Greenhouse Gas Initiative (RGGI) has been in operation across the Northeast US for six years and has a mechanism to reduce allocations, which was beneficial with the recent coal-to-gas switch. California’s system came online within the last year. Given the size of the California economy, if this market is more successful than the European market, we can expect additional good news and participation. If gruops connect existing these markets, and new ones, the prospect for emissions reductions is better than it looks today. As Böhm wrote, the time for half-measures is long gone. The world needs smart, aggressive action to avoid the worst global change effects at the end of the century. Carbon markets are likely a part of the solution, so long as they’re planned and managed well. Categories: global warming, policy | Tags: California carbon market, carbon market, carbon markets, clean energy investment, clearing price, climate policy, energy policy, ETS, EU Emission Trading Scheme, policy, Regional Greenhouse Gas Initiative, reserve price, RGGI | Permalink. During March 2013, the Scripps Institution of Oceanography measured an average of 397.34ppm CO2 concentration at their Mauna Loa, Hawai’i’s Observatory. This value is a big deal. Why? Because not only is 397.34 ppm the largest CO2 concentration value for any March in recorded history, it is the largest CO2 concentration value in any month in recorded history. More on that below. This year’s March value is 2.89 ppm higher than March 2012′s! Most month-to-month differences are between 1 and 2 ppm. This jump of 2.89 ppm is very high, but is ~0.5 ppm less than February’s year-over-year change of 3.37 ppm. Of course, the unending trend toward higher concentrations with time, no matter the month or specific year-over-year value, as seen in the graphs below, is more significant. If we extrapolate last year’s maximum value out in time, it will only be 2 years until Scripps reports 400ppm average concentration for a singular month (likely May 2014; I expect May 2013′s value will be ~398ppm). Note that I previously wrote that this wouldn’t occur until 2015 – this means CO2 concentrations are another climate variable that is increasing faster than experts predicted just a short couple of years ago. For the most part, I stand by that prediction. But actual concentration increases might prove me wrong. Here is why: the difference in CO2 concentration values between May 2012 and March 2012 was 2.33 ppm (396.78 – 394.45). If we do the simplest thing and add that same difference to this March’s value, we get 399.67 ppm. That is awfully close to 400 ppm, but less than the 399.93 ppm extrapolation I performed last month. I discussed May 2013’s projection with Sourabh after last month’s post. They predicted 399.5-400 ppm concentration for May 2013. I think NOAA will measure May 2013’s concentration near 399.3 ppm. There are other calculations that we could do to come up with a range of predictions, but I unfortunately don’t have the time to do them right now. I will have content myself with waiting until June to find out how fast concentrations rose through May. I normally post CO2now.org’s chart of CO2 concentrations since 1958/59 for a given month. They finally posted last month’s average concentration value yesterday, but have not updated their graph from February 2013 yet. When they do, I will update this post. 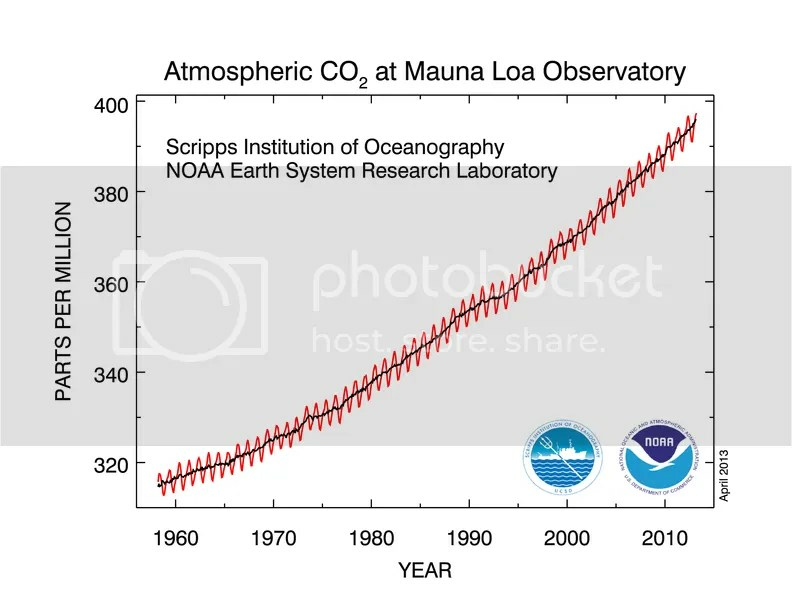 Figure 1 – Time series of CO2 concentrations measured at Scripp’s Mauna Loa Observatory in March from 1958 through 2013. 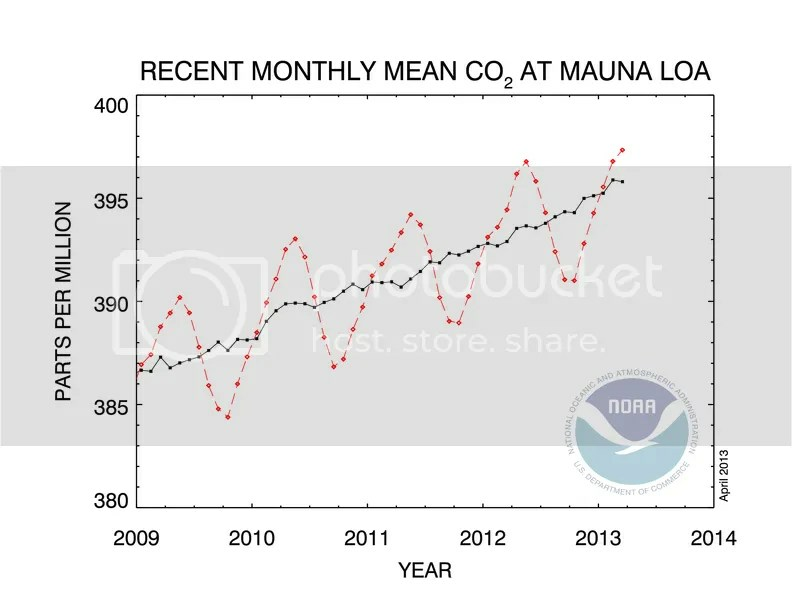 Figure 2 – Monthly CO2 concentration values from 2009 through 2013 (NOAA). Note the yearly minimum observation is now in the past and we are two months removed from the yearly maximum value. NOAA is likely to measure this year’s maximum value near 399ppm. Figure 3 – 50 year time series of CO2 concentrations at Mauna Loa Observatory. The red curve represents the seasonal cycle based on monthly average values. The black curve represents the data with the seasonal cycle removed to show the long-term trend. 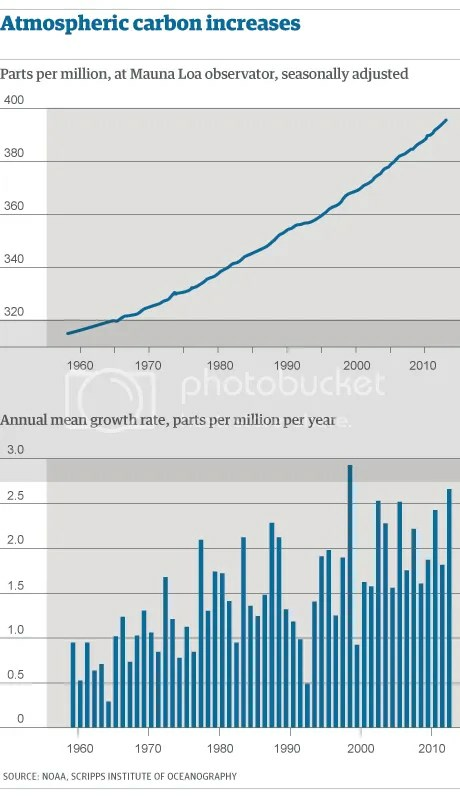 This graph shows the recent and ongoing increase in CO2 concentrations. Remember that as a greenhouse gas, CO2 increases the radiative forcing of the Earth, which increases the amount of energy in our climate system. The top part of Figure 3 should look familiar – it’s the black line in Figure 3. The bottom part is the annual change in CO2 concentrations. If we fit a line to the data, the line would have a positive slope, which means annual changes are increasing with time. So CO2 concentrations are increasing at an increasing rate – not a good trend with respect to minimizing future warming. In the 1960s, concentrations increased at less than 1 ppm/year. In the 2000s, concentrations increased at 2.07 ppm/year. This isn’t surprising – CO2 emissions continue to increase decade after decade. Natural systems are not equipped to remove CO2 emissions quickly from the atmosphere. Indeed, natural systems will take tens of thousands of years to remove the CO2 we emitted in the course of a couple short centuries. Human systems do not yet exist that remove CO2 from any medium (air or water). They are not likely to exist for some time. So NOAA will extend the right side of the above graphs for years and decades to come. The greenhouse effect details how these increasing concentrations will affect future temperatures. The more GHGs (CO2 and others) are in the atmosphere, all else equal, the more radiative forcing the GHGs cause. More forcing means warmer temperatures as energy is re-radiated back toward the Earth’s surface. Conditions higher in the atmosphere affects this relationship, which is what my volcano post addressed. A number of medium-sized volcanoes injected SO2 into the stratosphere (which is above the troposphere – where we live and our weather occurs) in the last decade. Those SO2 particles reflected incoming solar radiation. So while we emitted more GHGs into the troposphere, less radiation entered the troposphere in the past 10 years than the previous 10 years. With less incoming radiation, the GHGs re-emitted less energy toward the surface of the Earth. This is likely part of the reason why the global temperature trend leveled off in the 2000s after its relatively rapid run-up in previous decades. This situation is important for the following reason. Once the SO2 falls out of the atmosphere, the additional incoming radiation will encounter higher GHG concentrations than was present in the late 1990s. As a result, we will likely see a stronger surface temperature response sometime in the future than the response of the 1990s. The rise in CO2 concentrations will slow down, stop, and reverse when we decide it will. We can choose 350 ppm or 450 ppm or any other target. That choice is dependent on the type of policies we decide to implement. It is our current policy to burn fossil fuels because doing so is cheap, albeit inefficient. We will widely deploy clean sources of energy when they are cheap, which we control. We will remove CO2 from the atmosphere when we have cheap and effective technologies and mechanisms to do so, which we control. Today’s carbon markets are not the correct mechanism, as they are aptly demonstrating. We will limit future warming and downstream climate effects when we choose to do so. For years I’ve heard fellow Democrats argue that we can’t let the perfect be the enemy of the good, that it’s better to vote for the lesser of two evils, and other inane arguments to convince me to vote for people who have (D) behind their name but are not strong advocates of Democratic values. “It’s always better to vote for a (D) than an (R),” they say. Really? I haven’t thought so for a long time and have voted accordingly come election time. That means I haven’t voted for “Democrats” than I don’t think will stand up for the issues I think are most important: climate change, privacy, jobs, universal health care, gun safety, etc. Many pundits are saying today that President Obama was very angry yesterday following the US Senate’s ridiculous failure to pass watered down, gun industry influenced amendments. Oh, a majority of Senators (50+ out of 100) voted for the legislation, which in sane circumstances would mean the amendments pass. Not in the US Senate yesterday, where a very small number of fringe Senators stopped honest consideration of any amendments. That is because of the Senate’s cloture rule, which once invoked requires 60 votes (a supermajority) to break. Democrats could have changed or removed that rule at the beginning of the current session with only 51 votes. Unfortunately, Sen. Reid (D-NV) didn’t agree that the majority needed to change or remove the rule. Instead, he made a deal with Minority Leader Sen. McConnell (R-KY) that cloture would be invoked on legislation and nominees only in “extreme circumstances”. Since January, Republicans have invoked cloture again and again and again and again. Apparently, there is a permanent state of “extreme circumstances” in the Senate according to today’s Republicans. Sen. Reid publicly complains that the rules could be revisited mid-session, but his complaints are ever-moving carrots for the Democratic base, who must enjoy being lied to. Sen. Reid will not change the cloture rule because he doesn’t want to; it has nothing to do with courage or will. The sooner the base accepts that, the sooner they’ll vote for Democratic Senators who care more for their constituents than the access to power a Senate position entails. Observe then that these same Republicans are the people with whom the President wants more desperately than anything to craft a Grand Bargain – be it health insurance in 2009-2010 (note: not health care) or the national debt and social welfare programs (which this “Democratic” President proposed be slashed!) and gun safety legislation now in 2013. The very same Republicans that so angered the President on his surprising signature issue (gun safety – when did he campaign on that?) have worked since 2009 to stop anything the President wants done. Yesterday’s public display of anger, which I’m not sure was honest, will not cause the President to evaluate his most desired goal: that Grand Bargain. The Republicans will not work with the President and the President and his most ardent supporters refuse to acknowledge that basic political reality. Moreover, the President has only his zealous desire to reach his Grand Bargain to blame for yesterday’s cloture votes. In the absurd push to enact health insurance legislation in 2009 and 2010, which took months too long precisely because the President wanted that Grand Bargain so badly, health care reform was explicitly removed from consideration a priori to negotiation. That health care reform was a central plank of the Democratic Party’s most loyal activists, who worked tirelessly in 2008 to get the President and other Democrats elected at all levels across the nation. There was no mention of a Grand Bargain in the 2008 campaign. Democrats justifiably felt misled and were extremely disappointed. Hence, they didn’t vote with similar intensity in 2010 as they did in 2008, which had enormous ramifications. Governorships and state legislatures flipped from Democratic to Republican. As a result, the required realignment of political boundaries for the US House and state legislatures following the 2010 census were redrawn in ways that led to more Republicans, many of whom were Teabaggers whose core philosophy is government cannot and should not work, elected in newly safe seats. That is, people in 2010 made sure that the mix of voters in districts leaned heavily enough Republican that any other candidate would have a very hard time being elected. Hence today’s Republican-led chamber despite the fact that Democratic candidates nationally received 1,000,000 more votes than Republican candidates. There simply aren’t enough Democrats and left-leaning unaffiliateds in these districts to challenge what will be Republican dominance. Remember that when Democrats tell you there are “only 17 seats” they need to flip in 2014 to take back control of the House. Absent some significant change in the political landscape, Democrats will not take the House back in 2014. Teabaggers will remain in control of the chamber and a Democratic Senate Majority Leader will not change chamber rules (again) in January 2015, regardless of how many bills Republicans filibuster; regardless of how many judicial and agency nominees Republicans filibuster who are proving that government cannot and will not accomplish anything. Senators didn’t lack courage yesterday. They simply do not see any downside to voting against their constituents’ wishes. When most Democratic voters “vote for the lesser of two evils” no matter what, they are not holding their elected officials accountable for their actions. Thus, Republicans will continue to abuse the filibuster. The President will seek more Grand Bargains. And we will make very little progress in a time when much progress is needed. But come November 2014, I will hear once again that I have to vote for the same people who voted against my values, who only want to stay in power, because the alternative is just unthinkable. Senators who abuse a parliamentary tactic do so for one reason: to remain in power. Senators are not there to represent anyone or anything except their access to power. People on the “news” networks are saying Republicans thwarted the will of 90% of the American public yesterday. The President and the Senate Majority Leader both could have done very different things had they wanted to avoid yesterday’s political result. They didn’t want to, so they didn’t do things differently. They did exactly what they wanted to do and stuck the rest of us with the devastating results. Remember that the next time someone tells you it’s better to vote for the lesser of two evils. Evil still happens: someone slaughtered 20 innocent children with a tool designed exclusively to kill other humans. If a plastic toy killed 20 children, we would ban the toy. The right to own a gun ends at the life of others, especially children. More than 30,000 people die because of gun violence in the US every year. Their blood is as much on the hands of “Democrats” who advocate for political cowardice as it is on the shooters; for voting for the lesser of two evils because what other choice have we? We have choices, but are purposefully misled by people who only want to remain in power, then show public displays of anger. Finally, minorities can be vocal, but they shouldn’t be able to thwart democratic processes single-handed. Actually, one more thought. Does anyone seriously think the NRA won’t target Democratic Senators in their 2014 elections even if those “Democrats” voted against gun safety amendments yesterday? The same amendments that a majority of constituents in those Democratic Senators states supported? Categories: politics | Tags: cloture, filibuster, Grand Bargain, President Obama, U.S. Senate | Permalink. 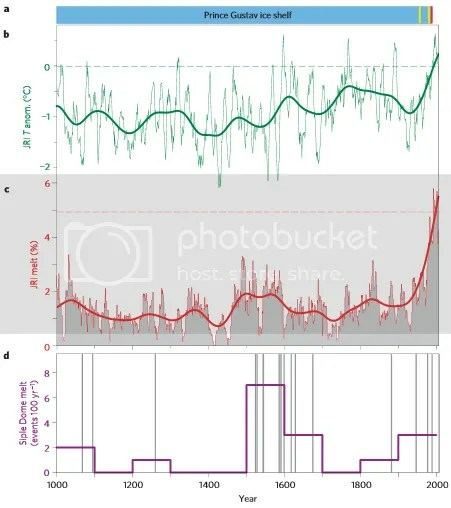 Abram et al.‘s Figure 5| Melt response over the past millennium. a, Schematic of Prince Gustav ice shelf history showing its presence (blue), intervals of rapid retreat (1957 and 1989; yellow) and collapse (1995; red). b,c, JRI mean temperature anomaly (green;b) and melt percentage (red;c) shown as 11-year moving averages. Thick lines are 21-year Gaussian kernel filters; dashed lines denote 1981–2000 mean. Lowest temperatures and melt occurred at AD 1410–1460, followed by progressive warming and a nonlinear melt increase. d, The occurrence of melt layers (grey lines) and a 100-year stepped average of melt frequency (purple) at Siple Dome in West Antarctica. New research published in Nature Geoscience from Nerilie J. Abram et al. (subs. req’d) presents evidence that West Antarctic ice melt accelerated over the course of the last 1,000 years. About 400 years ago, average temperature anomalies (based off the 1981-2000 mean) increased from -1°C to -0.75°C (green curve in above graphic). You can see the interannual and interdecadal variability in this time period, which was natural. Then, starting 100 years ago, temperature anomalies rose from -0.75°C to today’s slightly positive anomaly. As a result, the melt percentage jumped to 5% at James Ross Island. That melt jump was nonlinear due to the ~0C melt threshold. As the authors state, “where summer temperatures do exceed the melting threshold, the amount of melt produced is proportional to the sum of the daily positive temperatures rather than their mean. This means that as average summer temperature increases and positive temperature days become warmer and more frequent, the amount of melt produced will exhibit an exponential increase”. That cause-and-effect relationship is one reason why a 3°C average temperature rise carries so much more impact than a 2°C average temperature rise in polar regions. It also explains why small changes in historical temperatures allowed the ice shelves to form in the first place. The large “permanent” ice shelf collapses in recent history are the effect of rising temperatures. It should be obvious too that predicting the timing of future ice shelf collapses is difficult if not impossible. Based on the above, we know that West Antarctica is warming very rapidly. We know that warming anomalies are growing exponentially. Problematically, even small temperature changes cause exponential changes in melt. Exponential change growing off of exponential change creates a highly nonlinear, and therefore very unpredictable system. What might that mean for the WAIS? It could mean that rapid effects take place in the future. In other words, ice sheet properties could change quickly. Large melt areas could start one day without very little prior signal. Additional ice sheet collapses could take place without much notice. Increasing greenhouse gas emissions will cause increasing radiative forcing, which in turn will cause increased heat storage by some climate component (primarily the ocean to date, but also the atmosphere). Current global energy imbalance guarantees decades’ worth of additional heating. That heat will eventually impact Antarctica and its massive ice sheet. Melting of global land-based ice to date increased global sea level by an average of 8 inches in the last 100 years. If the entire West Antarctic Ice Sheet melted (which would happen sooner than East Antarctica because it rests on bedrock below sea level), sea levels would rise 4.8 meters. The entire WAIS won’t melt for centuries, but sea levels would easily rise more quickly than the current 3mm/yr as annual WAIS melt increases due to increasing temperatures. There is no catastrophe knocking on the door today, but WAIS melt will affect coastal regions this century. Total sea level rise off the east coast of the US exceeded the global average, which has already caused communities to re-examine infrastructure. Higher levees and other protective structures either have been built or are being considered by cities such as Washington, D.C., Norfolk, and New York City. Efforts to date haven’t been sufficient (see Hurricane Sandy damage along the New Jersey shore), which points to a need for more aggressive analysis of needs and implementation of new climate-based policies. Costs to these and other communities will grow as international mitigation efforts stall. Categories: global warming, science | Tags: Antarctic ice sheets, climate change, climate change effects, climate policy, global warming, West Antarctic Ice Sheet | Permalink.